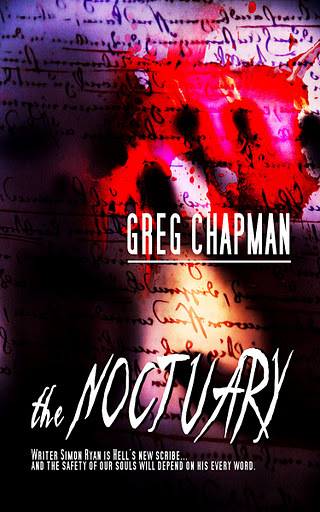 I can now unveil the cover to my forthcoming horror novella The Noctuary. The cover, created by Damnation Books’ head cover artist Dawne Dominique, is deliciously dark and really captures the themes of the book well. The Noctuary centres on Simon Ryan, a down-and-out writer, who receives a visit from one of the Dark Muses of Hell only to inform him that he is destined to become their scribe, helping them damn human souls by writing all manner of terrors into their lives. To prove he is worthy, the Muses give Simon the chance to go back and rewrite a horrific moment from his past…. Simon will witness the true power of words first-hand and use them to make a shocking choice or lose his soul for all eternity. The Noctuary will be released by Damnation Books as an e-book on December 1, with the paperback edition to follow. Stay tuned for more information as we get closer to the release date and don’t forget you can purchase my first novella Torment in paperback or ebook NOW. 1 Response to "The Noctuary" cover revealed!